You’ve probably seen a rollover crash in your lifetime. They are usually the cause of long backups on the highway because of all the looky-loos. When a vehicle in a collision tips over, rolls on its side, or lands on its roof, this is what is referred to as a rollover collision. Rollover collisions can and frequently do have passengers that have been ejected. The full or partial ejection is usually the result of not wearing a seatbelt or seatbelt failure and can ultimately lead to death of catastrophic injuries. Statistics say that only one percent of all traffic accidents account for rollover crashes. Sadly, this one percent results in one third of all auto and truck accident deaths. So, how does a rollover collision happen? Typically, a driver loses control while driving and the vehicle begins to slide sideways. I was driving from Conroe to Dallas last weekend and drove through a rainstorm. My vehicle hydroplaned and started to slide. If this doesn’t get your heart racing, I don’t know what does. Had my vehicle struck a curb, guardrail, or even the earth at the edge of the highway, I could have been the victim of a rollover crash. Drivers that attempt to turn when speeding are also the reason for rollover crashes. Rollovers can be even more dangerous when your vehicle strikes another vehicle or slides over into oncoming traffic. Cars or trucks that are hit by another vehicle can often cause a rollover crash. Trucks and other vehicles that collide at a high rate of speed is a common cause of rollover crashes. The results of this type of car or truck crash is usually devastating. Statistics show that when a driver is impaired the likelihood of a rollover crash increases. Due to intoxication from drugs and alcohol, drivers are slow to react and may not drive safely or have the proper state of mind in order to not over correct in a car accident. Rollover collisions can sometimes be traced to defects in the vehicle or the tires. We all remember the product liability cases involving defective tires some years ago. We had a recent client where the tread separated from his tire and could have caused a serious accident. Luckily, no one was hurt. If they had been travelling on the highway the tire defect could have been deadly. Older vehicles are much more prone to rollover collisions. New advances such as traction stability, and ABS brakes have made driving much safer in hazardous conditions. Rollover collisions can be deadly. 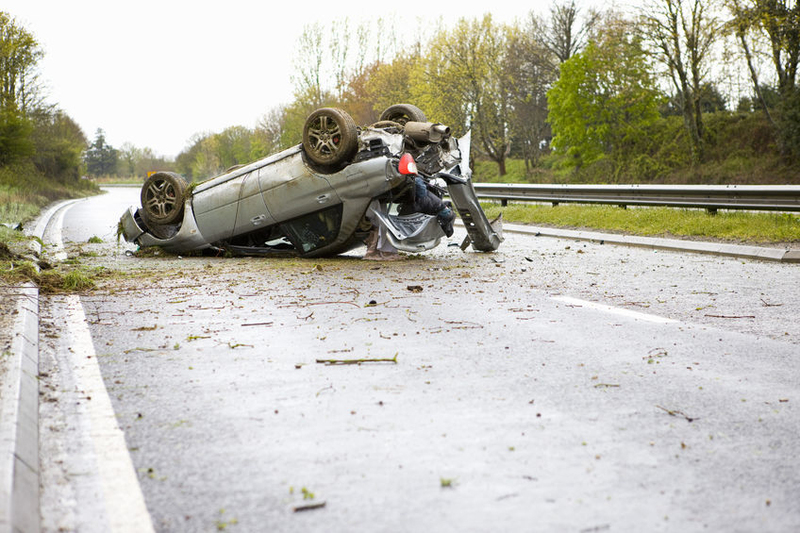 If you or a loved one is involved in a rollover collision, they need to contact an experienced auto or truck accident lawyer or personal injury attorney. You may qualify for compensation against negligence, defects, and seek damages for your loss. Medical costs, injuries, hospital bills, lost income, and pain and suffering can bury an inexperienced person with no knowledge how to handle a claim. Be smart and contact an experienced attorney today. Call us.